Does your kid show interest in dancing jazz and you’re still thinking if it’s really worth it? There’s something about jazz dance that cheers people instantly. Jazz is a combination of many dance styles including ethnic dance, social dance and even ballet. It’s one of the most popular dance forms that people of all ages have been using for a long time now. Get to know the many benefits of jazz dance classes in this blog. We have compiled here the top reasons for you to sign up your kid in jazz dance classes. One of the most evident perks of joining jazz dance classes is its health benefits. Its athletic and full-bodied nature can boost your kid’s flexibility, strength and coordination. By enrolling them to jazz dance classes, they get to be trained with a series of stretching sequences that can strengthen their leg and lower back muscles. Since jazz is a quick-paced and high-energy dance style, it can also improve stamina. Aside from the its physical health benefits, attending jazz dance classes can be a great way for kids to express all their emotions. Is your kid always acting out? It may be because of pent up emotions. Whether they’re feeling sad or cheerful, they can execute all their feelings into dance steps. Jazz dancing is a great way to enhance your kid’s muscle memory as they keep up with the fast pace of jazz dance. They get to improve their level of focus as they get completely immersed with the upbeat music and moves during jazz dance classes. 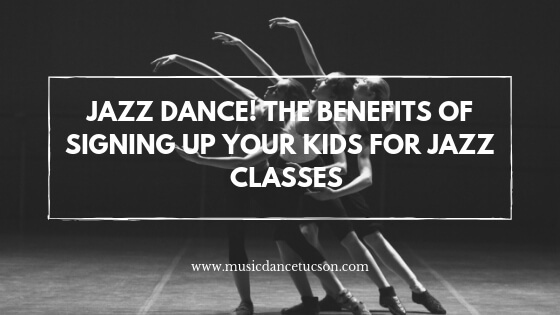 Now that you have all the reasons to enroll your kid to jazz classes, you may have been searching for the best jazz dance classes in Tucson area. Look no more! Music & Dance Academy offers jazz classes for all ages, from beginner to advanced levels. Classes are taught by highly qualified instructors who are extremely passionate about dancing and teaching. Contact us now and register for jazz dance classes.